If you are in the search for a z-wave appliance plug, you may have noticed that most of them are big and clunky. They are hard to install in small places like behind furniture and typically only allow you to connect one plug. Zooz just introduced to the market not only a small form factor appliance plug but it also features a dual outlet module capable of outputting up to a combined 10 AMPS. As a bonus, it also has a USB port capable of delivering 2.1 amps to power or charge your favorite devices. Note that the USB port is not controllable. To give you an idea of what 10 Amps are, we can use a 100 watt incandescent light bulb. At 120 volts, the typical current in the United States, a 100-watt light bulb draws 0.83 amps (100W/120V = .83 amps). In short, we would be able to power about 12 100Watt incandescent bulbs (9.999 amps) without any issue which is way more than any standard widget you may plug in there should use. If you do go over, the ZEN25 does have circuit protection that will disable both outlets. Before we start we want to get out there that this appliance plug is not going to be good for fans and motors, Zooz recommends that you use ZEN15 for that. The appliance module is sold in a nice black box and packaged very well. Its packaging resembles that of opening a high-quality cellular telephone in some aspects. In the box, you will find the ZEN25 and the instruction manual. The manual is well written and easy to follow although it is almost not even necessary due to its ease of use. It does provide easy to read instructions for all its features. The inclusion of the device to your z-wave network is among the easiest we have witnessed. Simply put your hub in inclusion mode and plug the double plug into the wall. The module will immediately begin to flash indicating it is in inclusion mode and go steady once it is connected. We included our double switch with a Vera Controller and the process was seamless. The device showed up as four switches and instantly shows you the wattage of the device that is plugged into the module when that specific outlet is turned on. On your hub, you will see one switch for the left, one for the right, and another that provides simultaneous control over both outlets. The fourth just gives you status on the USB port but you are not able to turn it on or off. Manual control of the device is simple, there is only one button on the device. To control the on and off of the right switch you simply press the button once each time you want to toggle status. Press it quickly twice to control the left side. Zooz really outdid themselves with this one. The device is quick to respond and also acts as a repeater using the latest z-wave plus technology. The rings around the outlets not only turn on when the outlets are on but they also indicate the wattage being used by the individual port. Each of the 7 colors indicating a different wattage range and the ring will be off when not in use. Finally, the double plug even includes a range test tool, we really liked this because at times it is hard to determine what range you have for certain devices and it is really easy to move this device around to perform a test without any special equipment. While the manual states that you simply press the button for 6 - 8 seconds consecutively to enable the range test, we noticed that all it did was enable and disable both outlet plugs simultaneously. We did, however, play with it long enough to figure out that pressing the button 3 times consecutively would enable the range test. After flashing for a few seconds in violet, it will indicate the overall signal strength using different color patterns on the rings around the outlets. 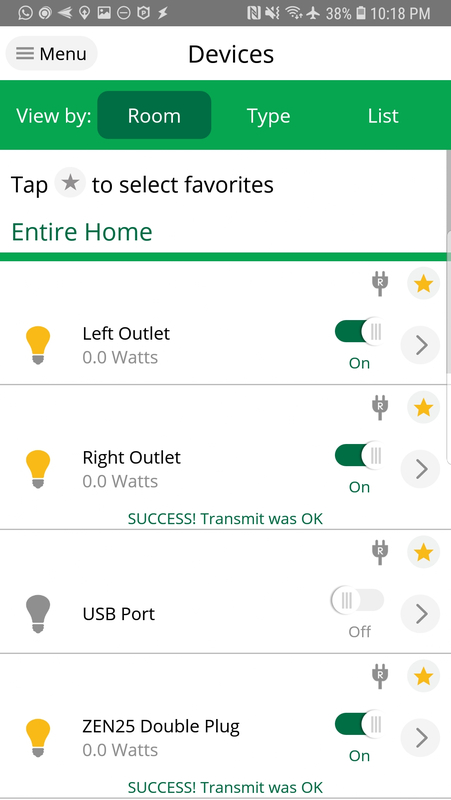 For the power users, you can also change your switch parameters via your hub to disable the LED rings around the outlets, set up an auto-on timer, or set up an auto-off timer. We really like the device and our favorite feature is that it is so small that it easily fits behind furniture. 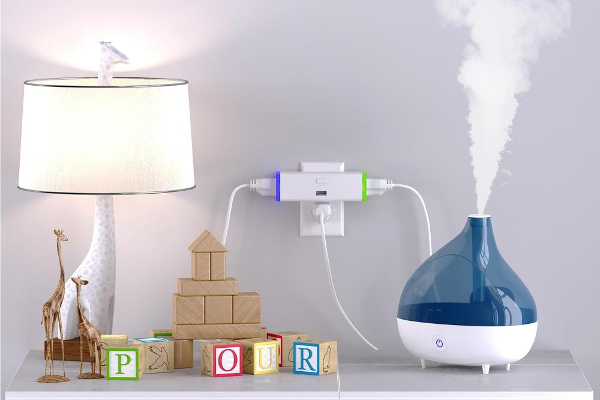 This device is perfect for kids rooms where you may want to control night lights and humidifiers or to control Christmas tree lights. Its features will make this a very versatile device capable of handling many scenarios. The device retails for $39.95 at The Smartest House. Click here to get your own now. Take a look at our video review below.